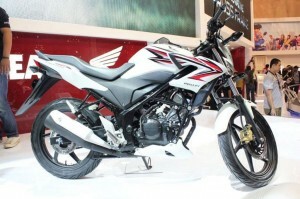 Japanese bike maker Honda has unveiled its most awaited CB 150R Streetfire in Indonesia at the 2012 Jakarta Motorcycle Show. As per information Honda is planning to launch CB 150R Streetfire in Indian market. The Honda CB150R Streetfire is the naked version of the Honda CBR150R, which is already on sale in the Indian market. The lack of full fairing and other expensive styling elements gives the CB150R Streetfire quite a price advantage. Power comes from the same 150cc, DOHC, liquid-cooled engine which produces a peak power output of 17.6 BHP at 10,500 RPM and peak torque output of 12.66 NM at 8500 RPM. This engine is mated to a 6-speed manual gearbox. The Honda CB150R has the same telescopic forks at the front and linked suspension at the rear like the CBR150R. CB150R Streetfire was showcased in 4 colors at the show – white, black, tricolor and orange (with accessories).